Cooking collard greens is different than greens like spinach and chard. However, their nutritional value and unique taste is worth the wait. Cooking collard greens is something that I didn’t think I would be doing this summer. However, when I received a nice bunch of this healthy veggie from the Stone Church Acres CSA, I knew I had to give it a try. I’ve only tasted collard greens a couple of times. 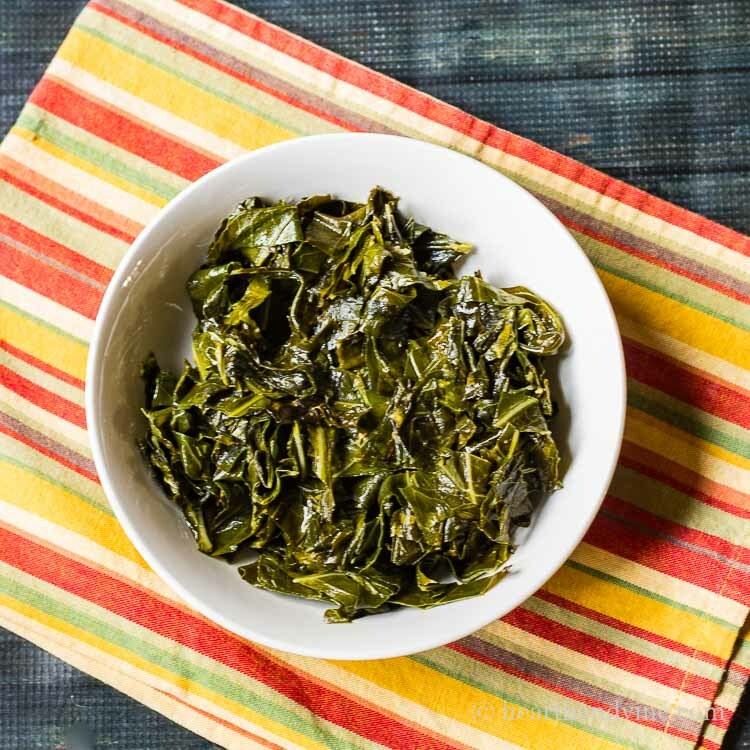 They seem to be offered a lot in the south, however, here in Pennsylvania, it’s rare to find collard greens on the menu. The gentleman at the farm made sure to tell me to remove the thick center stem before cooking. Then either use the stems for stock or toss them in the compost pile. 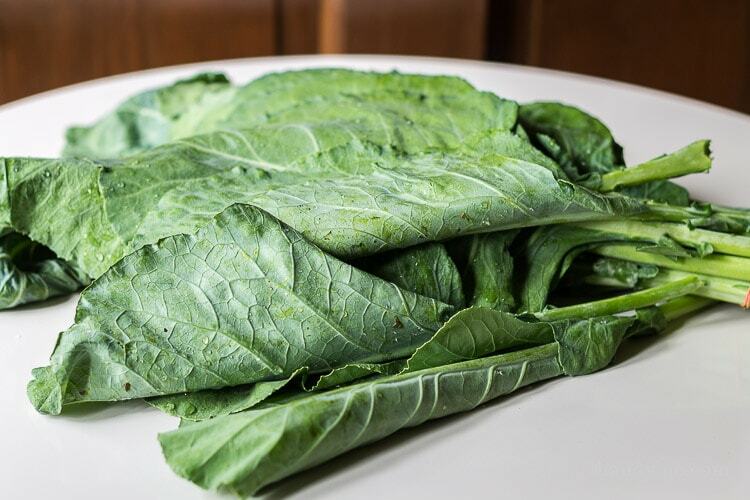 After discussing this healthy veggie with the people at Stone Church Acres and a little online research, I found out that there appear to be two keys to cooking collard greens. One is to slice them thin so that there is more surface area to cook. The second important practice to note when cooking collard greens is that they need time. Unlike cooking spinach or chard which cook up almost immediately, collard greens are tougher and need to be braised a bit. Most of the recipes I found used bacon as the fat to cook the greens, but I decided to stick with my usual EVOO. Do you know what? They were really delicious. Even my picky brother-in-law liked this healthy dish. I would definitely make them again. Wash collard greens, remove center stem and slice thinly. Add vegetable stock and stir. Add the garlic back in and red wine vinegar. That’s funny. I think of myself as a northerner (not as north as you are), but these greens were grown locally. Maybe the farm here is ahead of its time. I hope you get to try them sometime soon. I have never eaten these greens Patti. They look a lot like Kale, though I bet they taste quite different. Now I’m curious about them. I doubt they will grow in our garden zone but maybe I will find them in the store sometime. Thank you for introducing this new vegetable to us Northerners! This recipe looks so delicious! I have never grown collards myself but the farm that sponsors the CSA where I got them from is pretty close to my house and I’m in zone 6a which is pretty far north if that helps. They were definitely fun to try and tasted a little bit like cabbage. My grandparents were from the south but I’ve never had collard greens. I wouldn’t have known to cook them for so long, that’s good to know. At the discount grocery store, I shop they often have collard greens cheap, I’ll have to pick up a bunch next time and give them a try with your recipe. That’s great. I hope you like them. I love trying new veggies. This is so helpful Patti – being from the PNW I’ve never eaten collards and didn’t know what to do with them. Thanks! Isn’t fun to try new veggies. This is one of the things I love about being a CSA member. Last week they gave me a yellow watermelon. Never even knew there was such a thing. Yum! I grew up eating cooked greens covered in olive oil, vinegar and garlic… Oh how I loved it…. I’m hoping to get my Startle Garden Up and growing for a late fall harvest. Which means I’ll probably be purchasing already started plants…. I miss the greens!!! Well, you’re lucky enough to have that nice long growing season where you live so I’m sure you’ll have a thriving garden in now time. love collards! They are very healthy; I have ate my fair share of them growing up. That’s great to hear. I think I’m becoming a new convert. It’s funny how our tastes changes as we grow up. I’m sure bacon is fabulous, but I hate the lingering smell and my waistline needs a little help too, but I’ll have to try it one day soon.